Fault Code/Reset Tools: Models available to read trouble/fault codes, reset Check-Engine light, Service-Engine-Soon light, SRS, Oilservice and Inspection and maintenance mileage. See our products and their capabilities listed below. Now compatible up to 2007! Displays BMW engine fault codes; Helps diagnose exactly what's wrong. Resets the Check Engine Service Engine Soon Light. Resets the Oil service Inspection lights. For BMW Models (1994-02) Order Here! For BMW Models (2001-03) Order Here! For BMW Models (1987-07) Order Here! R5/FCX-3-U (plugs in under dash and under hood) $184.94 includes adaptor. Best choice for mechanics. Models available for most BMWs from 1994 to 2003. Displays all Airbag fault codes, tells you what's wrong. Resets the "SRS" "Airbag" Light. Very easy to use Low cost: ($129.99) each Includes instructions, code booklet & storage case. 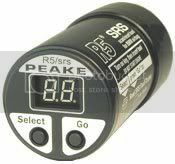 R5/SRS-U (plugs in under dash and under hood) $164.94 includes adaptor.